The renowned Icelandic artist Þorgrímur Einarsson has a growing fan base on social media, and in the art world: he’s about to be featured in the modern art magazine American Art Collector, and he’s been invited to exhibit his work abroad, including at Denver’s Abend Gallery. Þorgrímur had been composing and performing music his whole life, having studied musical composition at the School of Audio Engineering in London and the Royal Conservatoire in The Hague. While studying, Þorgrímur was surrounded by friends from different art scenes and started painting by accident when one of his friends handed him a paintbrush and a canvas. “I was about thirty years old when I tried painting for the first time and I completely fell for it,” Þorgrímur tells me. In which way are the two art mediums connected? Þorgrímur says he drives around with all of his equipment in his car, looking for something beautiful or interesting. Spontaneously, he then pulls over and starts sketching. If he’s already planned the picture, he photographs the subject, picks a few photos and paints using them. “Creating a single picture can take anywhere from two hours up to two weeks of work,” Þorgrímur says. Þorgrímur has gained a lot of recognition through social media with almost 10.000 followers on Instagram. He says the amount of followers increases with the right usage of hashtags and each time someone reposts one of his pictures. He’s obtained many opportunities through the medium, getting messages from galleries and random people interested in his work. Why do you think people take to your work? “My pictures are approachable. I paint things from our surroundings we all recognize and people might like to see them the way I portray them. I paint things that move me. I am just lucky that people seem to be moved by the same things. When did you realise painting was more up your alley? 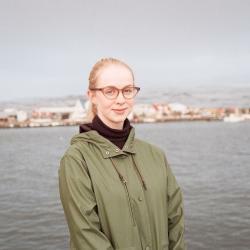 Having lived abroad for many years, Þorgrímur states that he is happy in his current situation, living in Iceland and being able to live off of his art. He would, however, like to move further into the American art market and will—as stated earlier in the article—be exhibiting his works at Abend Gallery in Denver. Þorgrímur will also exhibit new pieces this fall, October 29th at Gallery Fold. Check out his website here, and his Instagram page here.